Indian Rupee gets a symbol - Finally! 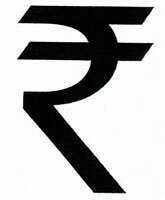 Today, The Union cabinet approved the adoption of the new symbol for Indian Rupee. This was done after holding a competition that drew more than 3,000 entries, which were evaluated by a deputy governor of the Reserve. The new symbol is designed by IIT post-graduate D Uday Kumar and is an amalgam of the devanagari script of the Hindi language and the Roman letter “R”, “reflects and captures the Indian ethos and culture”. Mr. Uday Kumar wins Rs. 2.5 lakh as a prize. "It's a big statement on the Indian currency... The symbol would lend a distinctive character and identity to the currency and further highlight the strength and global face of the Indian economy," Information and Broadcasting Minister Ambika Soni told reporters after the cabinet meeting. The symbol will be adopted in a span of six months in the country, and within 18 to 24 months globally, Soni said, adding that it will feature on computer keyboards and softwares for worldwide use. It would help distinguish the currency from the rupee or rupiah of other countries like Pakistan, Nepal, Sri Lanka and Indonesia. Though the symbol will not be printed or embossed on currency notes or coins, it would be included in the 'Unicode Standard' and major scripts of the world to ensure that it is easily displayed and printed in the electronic and print media. Among currencies with distinctive identities, only the pound sterling has its symbol printed on the notes. With this the rupee has achieved parity with major currencies such as the dollar, euro, pound sterling and yen. The new symbol looks pretty good. It has put our country to the elite list. I hope it goes from strength to strength.